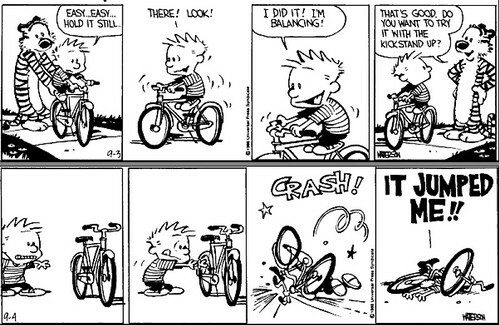 Learning to ride a bicycle – Calvin way! It’s been more than 2.5 years since I first posted this Calvin n Hobbes piece on this blog and it’s still the most read post (yep, as of today)! Enough reason to re-post it. Opinions on what this says about my other blog posts will not be entertained in a friendly manner. 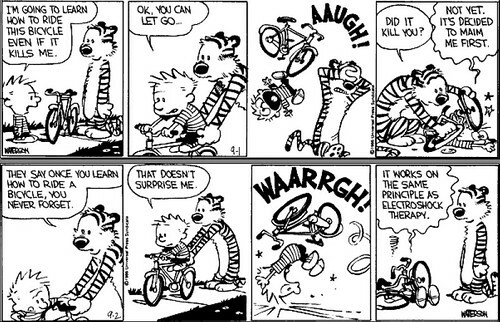 Enakku lesa paithyam – Calvin and Hobbes paithyam. ROFLLLLLLLLLLL!!!!! “it jumped me” LOL..LOL!!!! Hahaa.. for the first time I read it (in the book) I was rolling like an idiot.. hehehee..
That was really good:) Will have to start reading C&H sooner than later! I loved this one very much.But I loved ur parting shot ‘Opinions on what this says about my other blog posts will not be entertained in a friendly manner.’ even better. Giving cognizance to your warning , Im refraining from commenting on the views,lol.